I am a big sister now! I had some very good news this week to share! I am now a Big Sister for the Big Brothers Big Sister organization. I have always wanted to participate in this program. I met my little sister today. She is amazing and I can not wait to spend more time with her. However, this opportunity would not have been possible without all of the people who spoke with the organizers about my character and my abilities. This is going to be a great experience. It is a lot of responsibility, but I am so ready for it! My message today: Try to do something for others. Spending time with someone, does not mean you have to spend money. Sharing experiences can be free and worth your while! Again, thank you for the Facebook Likes! Keep them coming and I’ll keep writing. Pantene Pro-V has a new line for all types of hair. I of course appreciate the Curly: Dry to Moisturized line. I also swear by Noodle Head products. Especially the Noodle Head Curl Boosting Spray. The product does exactly that! Lifts your curls back to shape. It is a great product to use when hair is dry, after the sun, or if you just want to be lazy. If you think that straight hair is easier than maintaining your natural curls, think again. 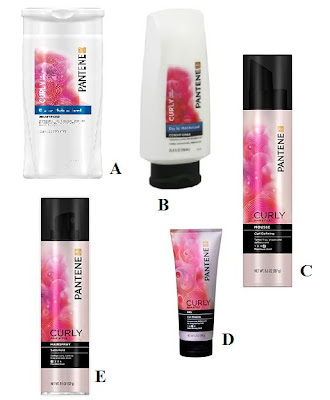 There are plenty of products that will help style, maintain, and manage your sassy curls! I would like to say that I always use the Internet to my benefit. That I am always productive, never bored, and always find something to do. 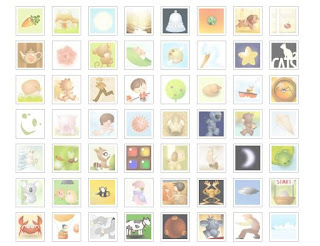 However, there is a beautiful collection of online games. Yes, beautiful! The characters are something one would see in a nursery or a children’s book. The music is peaceful and challenges the mind! Don’t just take my word for it, Go Play Orisinal! I’m not sure if the correlation between women and chocolate has been scientifically proven. What I do know is, that I love chocolate, anytime of the day. Maybe I should build a higher tolerance? For now, I rather just get “chocolate wasted”. 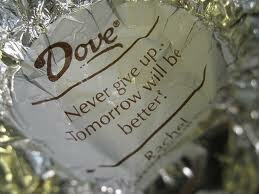 What makes it even harder to resist, at least Dove Chocolate, is that it’s also inspiring. Every wrapper has an uplifting quote on the inside. Not only does it make me what to eat more chocolate, but it also makes me forget how many more minutes I’ll need to add to the treadmill. Doesn’t every diet, deserve a small and sweet victory? Moderation is key! 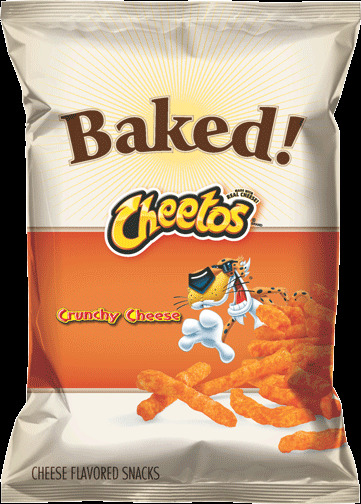 Although, I ended up eating the entire bag over a span of two-days, I wanted share some of my sweet discoveries. 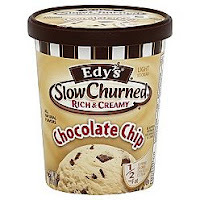 Not many products can satisfy a sweet tooth and make your soul for warm and fuzzy. 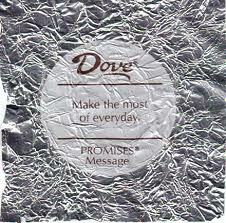 I definitely had many Dove Moments. I don’t want to give them all away! Make sure to get some the next time you need a chocolate fest party of one!